This 1000-acre conservation area provides access to 2 trails at the trailhead 0.5 mile from main entrance. These moderate walks lead through pine flatwoods and hydric hammock habitats. Hikers will also see cabbage palm hammocks and hardwood hammocks, with mangrove forests and marshes fringing the Indian River Lagoon. The interior marsh ponds and borrow lakes make great spots for canoeing, kayaking, and fishing. Two canoe trails invite a relaxing way for visitors to observe area wildlife. From Ice-Age animals to pre-Ais Indians to early pioneers, Pine Island Conservation Area also has a rich history. Mastodon tusks, pottery sherds, and 19th century farm tools found on site help piece together the story of this special place. 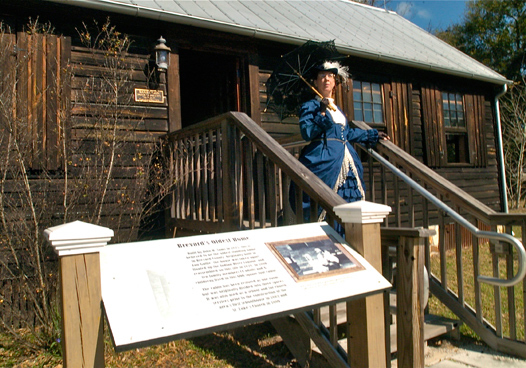 The oldest home in Brevard County, the 1875 Sams’ family cabin, and a large circa 1890 home are located here. The home and cabin will undergo restoration to become the future Pine Island Management and Education Center. Cycling is permitted on the established roads and bike trails only. Please do not ride bikes on hiking trails.